Wellington Road: My computer was born again. Hurray! My computer was born again. Hurray! After nearly killing my computer, I’m still feeling quite tender about it. I want to give it big cuddles and lots of kisses. I’m so glad you’re okay, baby! I love you! I really don’t know what I did. It might have had something to do with the router. Which stopped seeing my IP address. 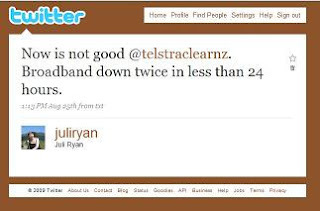 When my ISP (hi TelstraClear) was having, um, some issues. Side note, if you are on Twitter. You can get a quick response from a large company, if you just tweet a rant at them. Oops. Sorry, Comms Chris (the guy behind @telstraclearnz). But you probably get this a lot. If only Twitter had never been invented. Besides, the problem was probably a Microsoft update. I thought I had been shutting down my computer. With the (stupid) Vista Shutdown button. It looks like a shutdown button. But it's not. Hopefully, if you use Vista, you are smarter than me, and you have changed the setting. Otherwise, if you click on this, you are just putting your computer to sleep. And, while I am on the subject of stupid, um, Microsoft? Why does System Restore never work for me? Maybe I should just tweet this. Never mind. For the moment, I am tethered to my desk. I am weary after updates and installations. But I am grateful and relieved that my computer is up and running. And I still have my personal files. It’s even kind of nice my computer has been wiped clean. I don’t feel brave enough to sort out the router just yet, but I do miss being wireless. I hope, in time, I will find the courage to try again. Fingers crossed. I'm impressed that you got their attention on Twitter!! Good on ya! I can relate...I am glad you didn't lose your personal files. It's all such a headache though. I was surprised when I got a response to my tweet. And I acutally felt bad about it. My intent was just to let off steam. I don't think it's necessarily a good idea to rant on Twitter. Unless you aren't getting a response from a company, maybe. Vista is a nightmare. Can you go back to XP or whatever you were using before? I think Vista is actually dead or close to it because it was such a mountain of crap. And thanks for your vote, Juli. I don't even like curtains. George Eliot, Dooce and me. Is it all right if I call you a Kiwi? I'm coming out of the closet. Enough of the soapbox already. On being (sort of) green.